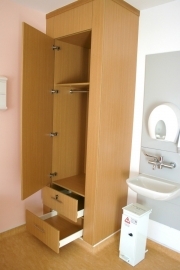 We manufacture a complete and comprehensive range of wooden fitted and free standing units, wardrobes, lockers, chest of drawers, fitted shelves and units, clinical rooms, seating units and much much more. From homely to dementia, to extra challenging environments. Extra challenging areas are glue screwed and dowelled for maximum strength. Heavy gauge hinges, ball bearing drawer runners, 18mm melamine faced MDF carcass, and backboards are used for all round strength. All units have safe rounded corners, 170-degree hinges and reinforced plates. 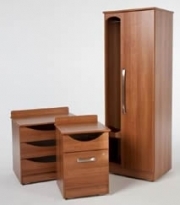 In our dementia furniture, wardrobes have open viewing areas, and drawers have large scooped out detail. 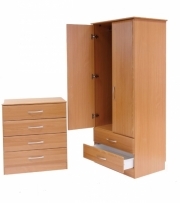 We also supply bedroom furniture in ivory, white and many other colours. All of our contract lacquer is 99.9% anti-bacterial. To further help with infection control, we carry a large range of handles and castors from which you can choose.